Creative Diagnostics offers high-quality plant pathogens antibodies, which are suitable for use in ELISA or related immunoassays and can be ordered in bulk quantity. Our plant pathogens antibodies have been developed for use in testing imported potato breeding material, microplants of existing varieties, leaf samples from field grown plants and tuber for the detection of many indigenous and non-indigenous potato viruses. Creative Diagnostics also offers high-quality plant pathogens test kit, including ELISA kit and rapid test strips for plant pathogens detection. Please click the links above for more information. The world is facing increasing demands for food, fibre and biofuels. Among the biotic factors that limit our ability to meet the demands are the plant pathogens that cause extensive annual yield losses of food worldwide. A plant pathogen is an organism that causes a disease on a plant. Plant pathogens that cause infectious plant disease include fungi, bacteria, viruses and parasitic plants. Although relatives of some plant pathogens are human or animal pathogens, such as Norwalk virus transmitted through contaminated food and water, most plant pathogens only harm plants. Plants in both natural and cultivated populations carry inherent disease resistance, but numerous studies have demonstrated the debilitating effect plant pathogens have on plants and devastating plant disease impacts. Rice blast, and citrus canker, for example, is common and recurrent plant diseases, and, in consequence, production is severely constrained. The accurate and rapid identification of the plant pathogens that cause plant disease is essential for effective disease diagnosis. Conventional methods based on the interpretation of visual symptoms do, however, have a number of drawbacks, which has prompted the search for alternative diagnostic techniques. The use of antibody technology is well established in medical diagnostics and interest in its use in plant pathology has been increasing over the last decade. Plant pathogens antibodies have already been widely used in antibody-based assays like lateral flow assay for detection of plant viruses and to a lesser extent fungi and bacteria, which are very rapid, simple, and do not require any special equipment or knowledge. Many plant viruses transmitted by vectors or direct contact cause billions of dollars of economic losses every year in the agricultural industry. Certain economically important plant viruses are widely used as models for the development of detection assays and counter measures,e.g., Grapevine fanleaf virus(GFLV), Potato virus X (PVX), and Tobacco mosaic virus (TMV). GFLV is the oldest known virus that infects grapevine plants, and it has a severe impact on grapevine cultivation worldwide, with losses of up to 80%. It belongs to subgroup A of the genus Nepovirus in the subfamily Comovirinae. GFLV is predominantly transmitted by nematodes in infected vineyard soils, where the virus can remain dormant for many years without any need for host plants. Furthermore, GFLV can be transmitted by grafting or the propagation of infected grapevine plants. The early identiﬁcation and quantiﬁcation of GFLV are therefore necessary to prevent the spread of disease and to plan and monitor measures, such as sanitary selection and soil is infection with nematicides. PVX is the type member of the genus Potexvirus in the family Flexiviridae. This virus infects members of the Solanaceae(e.g., potato, tomato, and tobacco), and in most cases it is transmitted mechanically from plant to plant. A new resistance-breaking isolate of PVX (PVXMS, also known as PVXfcaOl) that multiplies in genotypes carrying the Rx gene was detected in Argentina. TMV is the type member of the genus Tobamo virus in the family Virgaviridae. It was the ﬁrst virus to be discovered, and it is one of the best characterized. 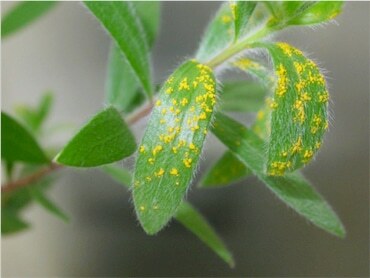 TMV has a wide host range, but it predominantly infects members of the Solanaceae, causing stunted growth, leaf necrosis, and yield losses. Although many infected plants show no symptoms or mild symptoms, yield losses of up to 30% have been reported in tobacco.